The Cowboys lost last night, but that's not good enough to sate the bloodlust of fans who want them to lose spectacularly, or painfully, because Dallas used to be good 15 years ago. Tony Romo didn't cooperate, failing to turn the ball over even once, let alone at a crucial moment late in the game. 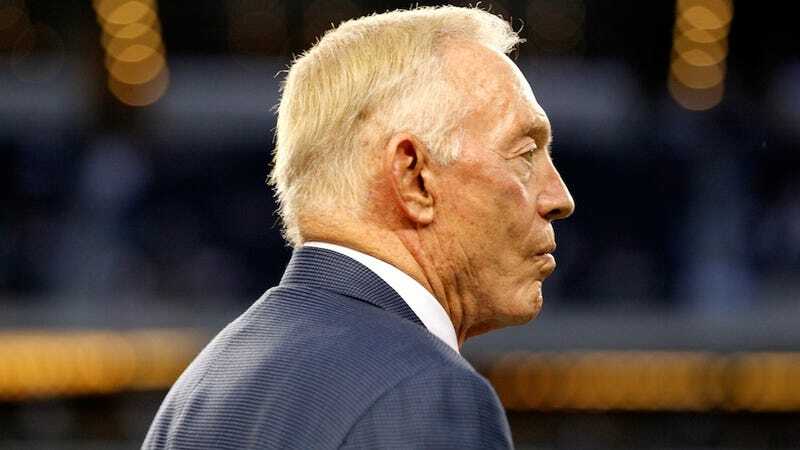 Luckily for us, Jerry Jones is physically incapable of not embarrassing himself. Matt Barrie of NBC 5 in Dallas witnessed a furious Jones trying, unsuccessfully, to get into the Cowboys' locker room after their 19-13 loss in Atlanta. Picture it. A 70-year-old billionaire, ready to tear into his team for falling further out of the playoff picture, and he can't open the door. Perhaps banging on it, yelling in his Arkansas drawl, wondering on an existential level how much money or hands-on control of your team you need just to get postgame access. Or maybe he was pushing when he should have pulled. "Well, I think so, because he was there to dismiss. I've always worked for myself and you can't do that. You basically have to straighten that guy out in the mirror when you work for yourself. But certainly, if I'd had the discretion, I've done it with coaches and certainly I would have changed a general manager." If you can parse that, more power to you. In the meantime we'll return to the mental image of a frustrated Jones angrily rattling a door, for it will continue to give us succor and warmth all through the winter.